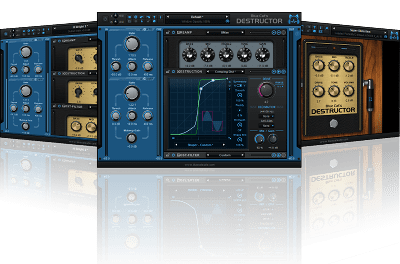 "In summary, Destructor is a revelation, bringing awesome distortion and tone shaping to your DAW at a great price.[...] Guitarists will get right down with this authentic amp simulation, and electronic producers will find endless sound design potential behind its intuitive interface." - Computer Music Magazine - December 2016 - [read review on musicradar]. Viable as a great sounding Amp sim as well as a downright filthy saturation and distortion plug in, Blue Cat Audio's destructor offers fantastic value for money." - rated "Excellent" by The garageband guide, October 2016 - [Watch video review here].
" 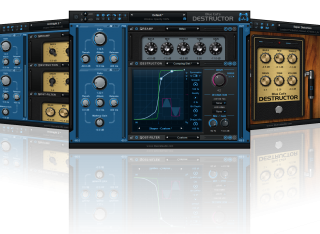 Destructor doesn't look like an amp simulator, but let's not make the mistake of underestimating the immense scope of this plug-in: Destructor is all about distortion in the broadest possible sense, and that includes guitar amplifiers - basically all of them ever! From clean tones to mild overdrive to ultra high-gain, Destructor is equipped with all the tools necessary to deliver tones from across the board. [...] Look no further if you’re after a new and refreshing approach to the amp simulation game" - Gearslutz. 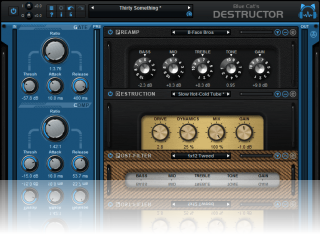 "Destructor is extremely handy for literally any tone you could ever want. [...] From crystal cleans to the most punishing yet articulate hi-gain you could ask for. [...] There simply is no other plugin on the market today that gives you the ability to create and customize tones the way Destructor and Axiom do." - Honest Amp Sim Reviews - [Read full review]. "I absolutely love this plug-in [...]. 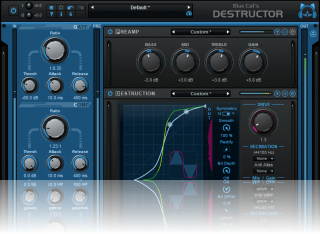 Destructor is a very impressive plug-in. Its capabilities are endless. I am very excited to use this plug-in in my future tracks and on stage." - Blayne Stone - [read full review]. "I must say it is so easy to use, and the scope for sounds and distortion [...] is just endless. [...] I forget that it's a plug-in, it's that good! These modules in the middle can be tweaked till the end of the world,[...] the possibilities really are endless. " - Pro Tools Expert, October 2016 - [full video review].
" 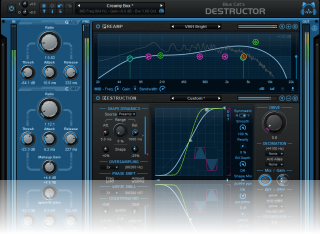 [Destructor] is capable of much more than just amp simulation and its range is everything from the gentlest, pleasing "warmification" to brutal audio annihilation. The shape dynamics control [...] is where Destructor truly shines in relation to most of the competition. [...] This allows for much nuanced distortion design and can contribute to much expressivity in final tone." - SoundBytes Music Magazine - Nov. 2016 - [full review]. "I am so blown away by the way this plug-in. I think it sounds absolutely amazing! " - Studio One Expert, October 2016 - [full video review]. 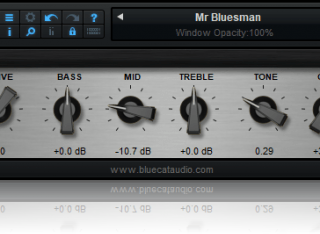 "Blue Cat Audio réalise [...] un véritable tour de force. Les modes "Easy" et "Edit" alliés aux multiples niveaux de presets satisferont tout le monde, du guitariste pressé à l’ingénieur du son exigeant, en passant par le Sound Designer en quête d’un traitement sur mesure. Et bien entendu, le son est définitivement de haute volée !" - audiofanzine.fr - Award "Valeur sûre" [Test Complet].